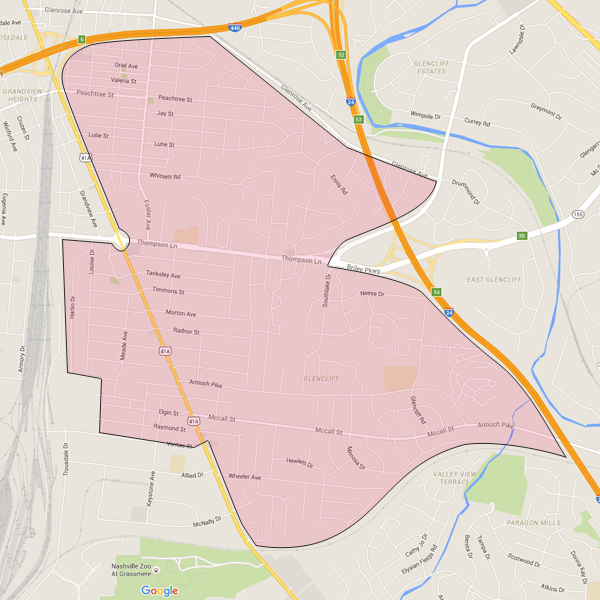 Located on the southeast side of Nashville and generally bordered by Nolensville Road, I-440, and I-24, the community of Woodbine (also known as Glencliff, Flatrock, or Radnor) is one of Nashville’s oldest suburban communities. It was first used as a meeting ground for the five Native American tribes that inhabited the Nashville area (Seminoles, Creeks, Chocktaws, Chickasaws, and Cherokees). In 1840, the area was encompassed by the 150-acre farm owned by David Hughes; Hughes’s daughter has been historically credited with naming the area Woodbine after the honeysuckle vines that grew around the property. The plantation land gave way to form the community as we now know it in the early 1900s, when it was settled by workers of the Nashville Railroad’s freight yard. Woodbine is known for its racial, ethnic, and socioeconomic diversity and thriving business community, and it showcases some of Nashville’s best local restaurants and international cuisine. Full of cute bungalow style houses and well-built mid-century homes, Woodbine/Glencliff/Flatrock is a great place to find an affordable home in which to raise a family. The area is not only convenient to downtown, but also is just a few minutes away from shopping and restaurants in Berry Hill, Melrose, Green Hills, Cool Springs, and Opry Mills. Added bonuses are Woodbine’s close proximity to the Nashville Zoo at Grassmere and the Nashville Fairgrounds. The Woodbine community is home to a diverse selection of churches, great local schools, parks, and a greenway. The recently enlarged, state-of-the-art Coleman Park Community Center includes an indoor pool, indoor/outdoor walking/running tracks, a playground, exercise classes, and club rooms with kitchen access available for rent. The Woodbine area is walkable, with sidewalks on most major thoroughfares and throughout many neighborhoods. This close-knit community consists of an excellent mix of long-time, multi-generational residents and new neighbors with young families, and it features homes at nearly every price point. It has a great neighborhood association and the local high school has been featured as the most diverse high school in the county (one of the most diverse in the state, in fact), boasting more than 40 different nationalities and 25 different languages spoken by its student body. As the Nashville real estate market continues to heat up, this area of town is seeing rising interest, too. Woodbine is predicted to be one of the next hip areas, as the houses are affordable, have lots of charming architectural features, are located on good-sized lots, and are incredibly convenient to I-24, I-65, I-440, and Briley Parkway, not to mention being situated on Nolensville Road—a straight shot into the heart of downtown. You’d be hard-pressed to find better access to Nashville than Woodbine provides. Rising interest aside, this is an area with a well-established community identity and pride; folks who move into this area these days quickly develop a partiality to this side of town and tend to stay.